South-eastern billionaire, Ifeanyi Ubah reeked of class and opulence as he attended a social gathering recently with other powerful figures. 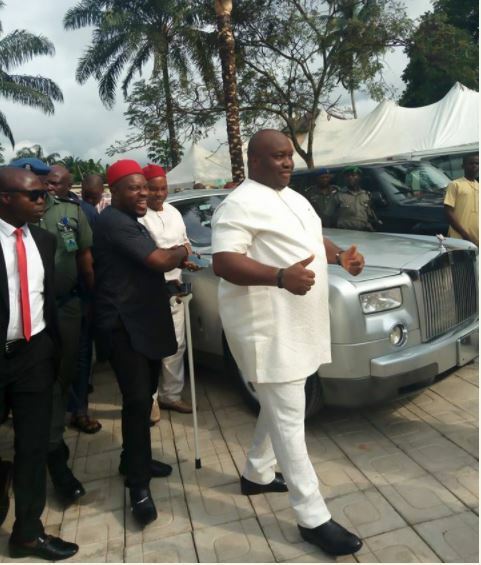 The Chairman of Capital Oil, Ifeanyi Ubah,who recently returned to the country – was today spotted with his enviable Rolls Royce at an event in Oraukwu area of Anambra state where he attended a marriage ceremony. The business mogul was in attendance with the Minister of Labour and Employment; Dr. Chris Ngige, Senator Andy Ubah and other high profile dignitaries as Chief Odunukwe Charles; Okemmili Oraukwu gave out his daughter in marriage. Ifeanyi Ubah has endured turbulent times with the Department of State Security in recent times after the state owned oil company – NNPC accused him of diverting litres of fuel amounting to N11 billion.